Those are some amazing deals!! The best part is that you can combine this sale, which runs from October 1st – 10th, with the month-long Designer Series Paper Sale! Did you notice how ALL of the stamp sets that are on sale have coordinating Designer Series Paper in the Buy 3 Get 1 Free selection?! Talk about a win-win; and a budget saver! 🙂 Of course, you don’t have to do ‘matchy-matchy’ with the DSP; most patterns can be used with multiple sets. That’s another benefit of our DSP being double sided! 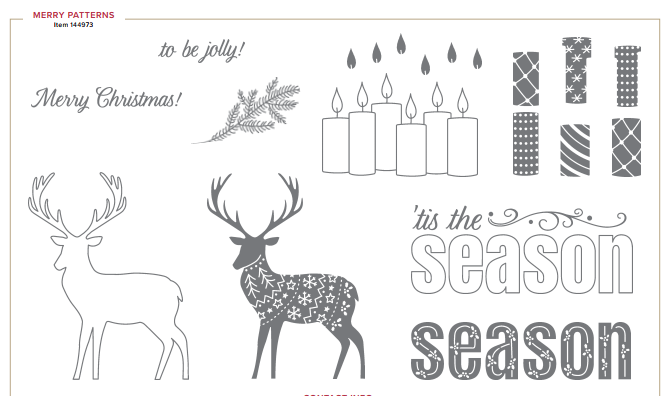 Of course, we can’t forget that you can earn the Merry Patterns stamp set for FREE with a qualifying order/party! You can get this terrific stamp set for FREE when your personal or party order totals $375 (before tax/shipping). So gather some friends together, host your own party or private card class, and get your order in before October 31st! With all the amazing products and specials, you’ll see that it’s not difficult to earn this free set! The World Cardmaking Day and Designer Series Paper specials start October 1st, so get your shopping list ready! Then, click on my signature below and go directly to my online store, where you can place your order any time, day or night. It’s always open for shopping!